Today, we have a latest government job notification for those job hunters who are looking for a banking job in SBI. The State Bank of India, which is also known as SBI, has newly circulated official information pertaining to SBI Recruitment 2017. The organization has particularized overall 2313 vacancies of Probationary Officer (PO) in the Bank. This is really immense opportunity of all job seekers. Therefore, the interested candidates are advised to apply online on or before the closing date of applying. Before doing so, the aspirants must put their eyes on the important details of State Bank of India PO Jobs Notification which are well-mentioned below on this page. The State Bank of India is one of the biggest banks of India. It is the only nationalized bank who doesn’t recruit the candidates with the help of IBPS (Institute of Banking Personnel Selection). For the hiring of qualified contenders on vacant post of Probationary Officer, the SBI has publicized this jobs notification. Under this notice, the organization invites the candidates who are eligible and are interested for these jobs. So, what have you decided? Are you interested in this Job? If yes then fill the SBI Probationary Officer Application Form. Want to get more details of this recruitment? Scroll down the page and get that easily. The contenders who desire to apply for these vacancies they must have completed graduation in any discipline from a recognized university. Important Note: The candidates, who are in the final year or semester of their graduation, may also submit their application forms provisionally subject to condition that at the time of personal interview they will have to provide the proof of having completed the graduation on or before 01-July-2017. According to the official notification, the age of applicants should not be below 21 years and should not be above 30 years as on 01-April-2017. Note: The candidates who belong to a reserved category they will get the relaxation in upper age limit as per the following table. Below is the category-wise fee structure. The aspirants who want to get selected for these vacancies they will have to participate in the below described rounds. The chosen contenders will get the pay package of Rs. 23700 to Rs. 42020 with advance increments. Ø First off, the eligible and interested candidates will have to log on to the official website which is “www.sbi.co.in”. Ø Monitor the homepage and find out the link that is most appropriate to this recruitment and also click on that link. Ø Check the link about “apply online” and hit on it. Ø Now, an online application form will be opened. Ø You have to fill this form correctly and upload the educational and further documents as per the authorized advertisement. Ø Pay the application via internet banking/debit card/credit card. Ø Later then, check the form that is the details you have submitted are correct or not. Ø If there any correction is required then correct that and submit this form. Ø Finally, download it and take a hard copy of your application form for future implication. The SBI Recruitment 2017 is a golden chance for all banking job seekers and such runners must exploit this opportunity by applying online. To apply you can use the official link of SBI that is accessible below. 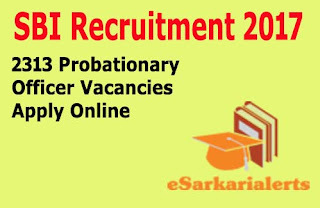 For the latest updates of this recruitment, the aspirants are advised to regularly have a look at eSarkarialerts.